I wish my life were like a musical brings us behind the scenes of musical theatre telling us the trials and tribulations of musical actors. Life of theatre performers goes through a lot of ups and downs that audiences don’t get to see. All of this is hidden behind the smiles that we see onstage, under the lights. But life is not always easy for them. The school, the auditions, and then, if they are good and lucky enough, the ensemble, being an understudy and finally the lead role. A long and hard run. This musical revue, written by Alexander Bermange, who is also the musical director, is full of theatrical jokes and it is beautifully performed by the four actors. Madalena Alberto, Cedric Neal, Lucas Rush and Suzie Mathers bring different characterizations on the stage brightening the first part of the show that is musically a bit repetitive. The song that gives the title to the show and Standing by are two beautiful ballads and lead to what for me is the most engaging and enjoyable song: The Diva is in the house, sung flawlessly by Suzie, who perfectly embodies a prima donna's attitude. 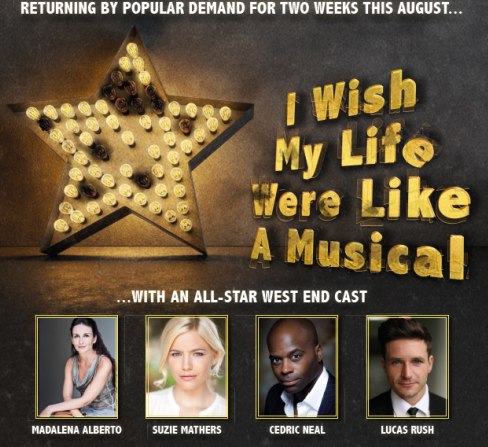 I wish my life were like a musical is a cheerful and uplifting show in what is one of the cosiest venues of London, the Crazy Coqs. If you are a passionate theatre goer or a hard-core musical fan, this is the show for you.